You can enable an existing grading scheme for your course by editing your Course Settings. 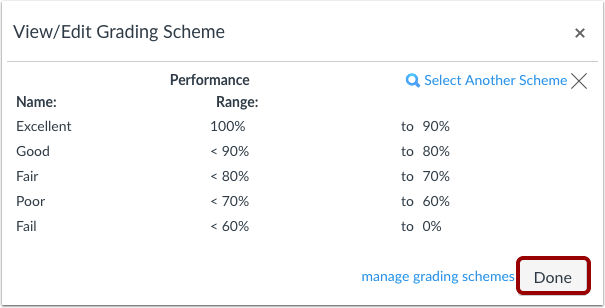 If you need to change your course grading scheme at any time, you can manage the grading schemes and find a new scheme. If you want to disable grading schemes for your entire course, you can deselect the grading scheme checkbox in Course Settings and your course will no longer be associated with a grading scheme. If you choose to use a grading scheme at a later time, you will have to re-enable a grading scheme. In a course export, the enabled course grading scheme is copied as the default grading scheme. Using an account-level grading scheme built by your institution links the scheme into your course—it does not import as a new scheme on the course level. 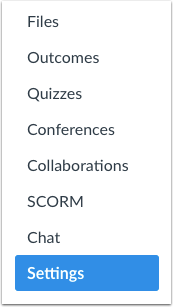 To create a grading scheme for your course, or to use a default grading scheme provided by your account, click the set grading scheme link. To enable a grading scheme that you have previously created in your course or that was imported using the Course Import Tool, click the view grading scheme link. Canvas will show you the Canvas default grading scheme. 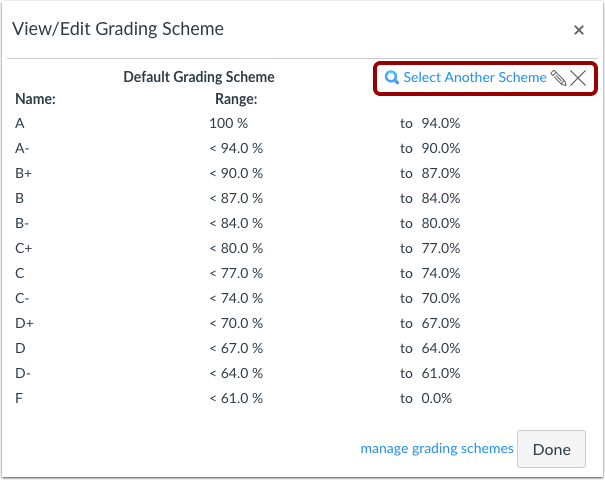 If you want to select another grading scheme, click the Select Another Scheme link. To view a grading standard, click the title of the grading scheme . When you have located the grading scheme you want to use in the course, click the Use This Grading Standard button . 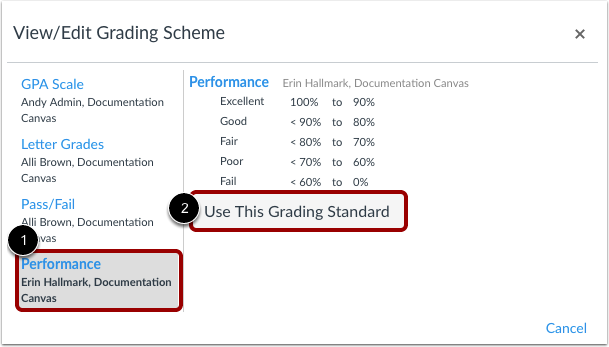 View your enabled grading scheme. Click the Done button. Previous Topic:How do I view grading schemes in a course? Next Topic:How do I add a grading scheme in a course? Table of Contents > Settings > How do I enable a grading scheme for a course?